Apple’s new iPhone XS Max is definitely shaping up to be the iPhone to have this year, which doesn’t exactly come as a surprise. People wanted a version with a bigger screen when the iPhone X launched last year, and now they finally have it. Of course, a 6.5-inch screen means the phone is pretty huge, so adding a big bulky case on top of that isn’t something everyone will want to do. 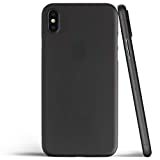 Lucky for you, the ultra-thin cases everyone loves are finally available for the iPhone XS Max on Amazon. The Totallee Thin iPhone XS Max Case measures just 0.02 inches thick, so it’s basically like covering your iPhone with paper. It provides great protection from scratches without ruining Apple’s sleek design. 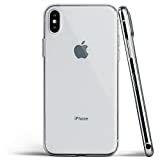 If you want an ultra-thin clear case, the Totallee Clear iPhone XS Max Case is the thinnest one in the world. Both cases are just under $20, and they’re both available now.